A campaign for safe staffing levels in Scotland is being launched tomorrow as new workforce figures reveal the ‘magnitude’ of the crisis in nursing teams. 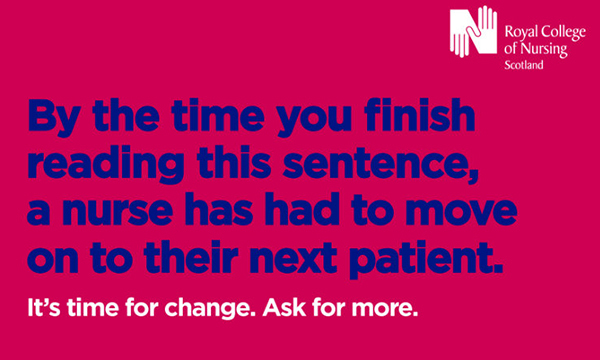 The Ask for More campaign, run by RCN Scotland, will raise public awareness throughout the autumn while members of the Scottish parliament undertake initial work on safe staffing legislation. The Health and Care (Staffing) (Scotland) Bill does not mandate minimum nurse-patient ratios, but it does require NHS boards and care services to use nationally agreed nursing and midwifery workload and workforce planning tools. RCN Scotland director Theresa Fyffe said: ‘If we get this legislation right it will help to ensure that nursing teams have the right staff to provide safe, effective and high quality care. Data released today by the Information Services Division (ISD), part of NHS Scotland, show the nursing and midwifery vacancy rate in the nation standing at 5.3% – equivalent to 3,311.2 whole-time equivalent (WTE) members of staff. RCN Scotland says this is the highest number of vacancies ever reported and means that one in 20 nursing and midwifery posts in the country is vacant. The ISD figures also show there were 59,455.9 WTE nursing and midwifery staff in post, representing a marginal annual increase of 0.1% (77.9 WTE). The RCN has called for legislation in each country of the UK to address staffing for safe and effective care. In a statement a Scottish Government spokesperson defended the Government’s track record on nursing. ‘Since 2007 the number of whole time equivalent qualified nurses and midwives has increased by 5.7%,' they said.